His wife Esther Marsh, of Sidney Tp. A group of us are trying to establish the children of William and Hannah White who settled in Sidney Tp. from NY. We feel we have linked them to this NY family and we now know that Reuben White is the son of this couple. Reuben White was an accomplished fellow. Significant land owner, saw mill and tavern owner, four times elected to the Legislative House of Assembly, commissioner for the building of the covered bridge over the mouth of the river Trent in 1834, Reformer and briefly jailed for his reform minded politics in 1837 and provider of the land for the erection of White's Church in 1841. Surprisingly, in 2004, researchers could not confidently determine who Reuben's parents were or where he was born. After much effort we now know that his parents are William White and Hannah Tompkins. His older brother Cornelius settled in Hallowell Tp, Prince Edward County and his sister Fanny married William Cunningham and also lived in Hallowell Tp. One remaining puzzle connected to Reuben is the statement in the Pioneer Life on the Bay of Quinte that Sarah White, who married Smitton Simmons, was a cousin of his. We have not yet figured out how this is true. Below are records that have been found that document Reuben's busy life. Reuben White, is the son of William White and Hannah Tompkin, was born Abt. 1779, maybe in Schoharie Co., New York, and died January 06, 1858 in Sidney Twp, Hastings Co.. He married Esther Marsh Abt. 1800, daughter of Mathias Marsh and Sarah Richardson. She was born July 07, 1784 in Manchester, Vermont, and died November 09, 1874 in Sidney Twp, Hastings Co.
i. Julia Ann5 White, born 1801; died Bef. 1851. She married George Zwick December 12, 1827; born April 22, 1801 in Upper Canada; died July 27, 1868 in Sidney Twsp, Hastings Co. Ont..
ii. Phoebe White, born May 26, 1803; died February 07, 1867 in Sidney Twsp, Hastings Co. Ont.. She married Henry Chambers Saylor Abt. 1819; born Abt. 1795 in U.S.A.
iii. Sarah A White. She married Jacob Burdick. iv. Hannah White, born Abt. 1805 in Canada West. She married Henry Jones; born 1794 in Canada West. v. Elizabeth E. White, born Abt. 1806 in Upper Canada; died in Dane Co., WI. She married Henry Wandal Yager March 02, 1824 in Sidney Tp, Hastings Co., ON; born Bef. May 14, 1802 in Claverack, Columbia Co., NY; died January 09, 1860 in Montrose, Dane Co., WI. vi. Perlina White. She married Jacob Burdick. vii. William White, born Abt. 1811 in Sidney Tp., Canada West; died Bef. 1858 in Wisconsin. He married Jane Shaw; born Abt. 1815 in NY; died Bef. 1870 in Wisconsin. viii. Clarissa White, died October 31, 1859 in Sidney Tp.. She married Robert Smith. ix. Stephen White, born February 1814 in Sidney Tp. ; died November 27, 1873 in Sidney Tp.. He married (1) Betsy Keeler Bef. 1834. He married (2) Maria Moon Aft. 1851; born Abt. 1824 in Canada West; died October 31, 1867.
x. Webster White, born 1817; died April 12, 1878. He married Eliza A Davis; born September 11, 1820; died October 14, 1903.
xi. Franklin White, born 1823; died May 31, 1859 in Whites Cemetery, Row 10. He married (1) Johanna Yates Bef. 1852; born 1823; died July 21, 1852 in Whites Cemetery, Row 10. He married (2) Phoebe Marshall Bef. 1855; born 1821; died January 10, 1855 in Smallpox, Whites Cemetery, Row 10. He married (3) Rachel Fralick nee Lockwood Aft. 1855.
xii. Caroline A White, born Abt. 1827 in Sidney Tp.. She married Cornelius Lawrence; born Abt. 1822 in Canada West. Sarah died in 1852 and Smiton in 1865 (ae95). They are buried at Colborne Union Cem, and I have somewhere a photo of the stone. Says he was from Poughkeepsie. I photographed it many years ago just out of interest's sake. I do not believe that Smiton (or Smitton) was born in England, I think that is one of Pioneer Life’s errors. Unfortunately I do not know where he was born for sure, but as his tombstone says Poughkeepsie, and the 1851 census says merely that he was born in the US, I think the England idea is just plain wrong. There are a number of other reasons for thinking that Smiton’s ancestors came from New England – possibly from Massachussets originally (although there is some reason to think Smiton’s father came to Dutchess from Rhode Island) – but this is a long way from proven just yet. None of the reasons are conclusive in themselves, but on a preponderance of evidence, it sems very likely. Sarah was born about 1777, apparently in Dutchess. If she is a cousin of Reuben’s then her ancestors came from New England as well. The pioneer, Reuben White, came to Sidney from the State of New York shortly after the American Revolution, and was probably a native of Scoharie County in that State. His ability soon brought to him a leading position in this community, at the time when men were judged by no other test; and, we find that he represented his riding in the Parliament of Upper Canada from 1802 to 1814. He was one of the Commissioners who advertised for tenders in 1833, and who in 1834 built the first bridge across the River Trent. The bridge is still in service and in good condition at Trenton. He amassed a considerable estate, owning a large lumber mill and a general store. He gave the land and sawed the lumber for the first church in Sidney, an edifice still in good preservation, and known as White's Church to this day. He married Hester, daughter of Mathias Marsh, in the early years of the century. She survived until 1884, Mr. White having pre-deceased her in 1857. Source: Colonel William Marsh, 1738 - 1816, Bruce Stinson, 1996, p. 103. The above came from a letter dated 10 Dec 1965 from Mrs Alice Richardson where on sheet E it says that William White is the father of Reuben. Copy WRS from the files of Bruce Stinson (deceased), from a visit to Bruce's wife Dec 2004. 2. His father, William White, was a Loyalist, who fought in the Loyal Rangers, a regiment formed by General Simcoe, our first Governor-General, during the American War of Revolution. Source: Booklet titled Centennial Souvenir, One Hundredth Anniversary Whites United Church, 1941, copy given to WRS by Mary Phinney, p 10/11. 3. "Now, as to the White family, I have read the “Pioneer Life” and found little in it of use to me. In fact, I am not really sure that Reuben was a brother of my ancestor Fanny. All I have to go on is the story that Fanny was married to William Cunningham at the home of her brother Reuben, and that after the wedding, William rowed some of the guests back across the bay. Which bay? Also, William Cunningham is supposed to have driven one of the White family wagons to Canada when the Whites moved there en masse. Since William was a Quaker and of Dutchess Co., N.Y., I can’t believe that the White family was of Schoharie, at least just prior to their removal to Canada. William Cunningham’s bakground I have pretty much nailed down. His mother was Abigail Richmond, a sister of Mary (Richmond) Allison who is buried with her husband Joseph in the old Adolphustown cemetery. Their stones were still standing last I knew. " 4. See the web page on William White for more current findings that confirm beyond reasonable doubt that Reuben White is the son of William White and Hannah Tompkin. Reuben White of Coeymans Tp., Albany Co., is listed as Head of a family of 10 people. This individual is not the Reuben White who emigrated to Sidney Tp. 2. "The petition of Reuben White, of Sidney, Member of the Assembly .....That your petitioner has for many years resided within a short distance of the Town of Belleville .... and has never received any land or order for land from the Crown. That your petitioner being desirous to build in said Town of Belleville humbly prays that your excellency will be pleased to grant him a lot in said Town ... Dated Apr 1821. The petition was recomended and a the deed is ordered 25 Apr 1821. A Gilbert and Stephen White are listed as making land claims as a militiaman who served in the War of 1812 - 1814 with the 1st Regiment Hastings Militia. Index of the Land Claim Certificates, Lauber, OGS, 1995, p. 97: RG9, IB4, V. 24, pp. 1577-83 and 1605-06, NAC. Could they be brothers of Reuben? On 11 Dec 1815, Cornelius White, Hallowell, sells to Reuben White, Sidney the E 1/2 of Lot 12 and all of Lot 13, Conc 1, Sidney for 600 pounds. Witnessed by John Dockstader and William Kelley both of Sidney. Signed 16 Dec 1815 and Reg 18 Dec 1815. Reuben White was granted 1/2 acre, Lot 39, west side of Church St., Belleville, subject to building a stone or brick or frame house not less than 24 x 18 ft within 2 years, dated 1 May 1821. Note states; settlement duly performed, dated 22 Jan 1823. Reuben White writes to Hon Peter Robinson asking to purchase part of Lot 1, Broken Front Sidney, dated 9 Dec 1828. Reuben White purchased the rear half of Lot 8 Con 2, Percy Tp in March 1833 and sold it in Feb 1851. "The construction of a bridge across the Trent, which took place in 1834, was a great benefit. It was 750 feet long and 32 broad. It was for many years the best bridge in Upper Canada. The 'Hastings Times' of Belleville, has an advertisement for tenders by the Commissioners, &c., C. Wilkins, Reuben White and James G. Bethune, dated River Trent, 9th March 1833." Reuben White is often mentioned as a saw mill owner however I have never found a solid primary document stating this to be true. It is also repeated that the lumber for White's Church came from his saw mill. However an 1855 map shows "Whites Saw Mill" and it is located on lot Lot 12, Conc 1 beside a stream. White's Church is also shown at the lower part of the same lot, on the road. Source: Sidney, Portrait of a Township, Celebrating Ontario's 200 years, Bayside Secondary School, 1985, p 13. The source of the re-produced map is not given. The tavern licence fee was set by the Court and it varied depending on the area, being higher in the large towns. On 5 Jan 1836 Reuben, along with 152 others were to pay the tavern licence fee, his being 3 Pounds 'in the country generally'. Again on 5 Jan 1837 the same fee was charged. Reuben White provided the land for what became White's Church. See this web page about the church. Bayside (first called Rhinebeck) - Sidney Twp. Began on Lot 13, Conc. 1 of Sidney. Consisted of a tavern, blacksmith shop, store, and houses. Whites Church (Episcopal Methodist) built in 1841 on Lot 12. White, Reuben, farmer, born USA, Episcopal Methodist, age 72 at next birthday. Owned a 2 story frame house, Tavern, an Episcopal Methodist church capable of holding 1000 people, frame. Reuben was the elected representative for Hastings County in sessions; 8, 9 and 11. 8th Parliament of Upper Canada - 31 Jan 1821 - 19 Jan 1824 - only rep. for Hastings. 9th Parliament of Upper Canada - 11 Jan 1825 - 25 Mar 1828 with Thomas Coleman. 10th Parliament of Upper Canada - not elected - Joseph Lockwood and James Hunter Samson are reps.
11th Parliament of Upper Canada - 7 Jan 1831 - 6 Mar 1834 with James Hunter Samson. 12th Parliament of Upper Canada - 7 Jan 1831 - 16 Apr 1835 - not elected but his son-in-law, Henry W Yager is along with James Hunter Samson. "White, Reuben, b, Schorarie County, NY; d 1857; m Esther (or Hester) March (sic); eight daughters, four sons. Quaker. Miller, merchant. Granted a town lot in Belleville. Lived in Sidney Twp. Member of the House of Assembly (MHA) from 1820 - 28, 1830 - 34. Reformer. Sources: "PAC, RG 1, L3, vol 529, w13/13; MG 9, B 8-12; Pioneer Life of Bay of Quinte pp 857 - 59; C. Read and R. Staggs, eds. The Rebellion of 1837 in Upper Canada (Toronto 1985), 284." Members of the Assembly were paid and there are 3 records of this. On 27 Apr 1833 he was paid in cash, amount not specified. On 28 Apr 1837 he was paid 42 Ponds, 10 shillings and on 27 Jun 1837 he was paid 52 pounds. See letters (No's 2, 3, 5) written by Reuben White to his son in law, Henry W. Yager at a time when Henry was an MPP. Source: transcriptions of the Henry W Yager Fonds on this web site. A note reads, "Reuben White was a prosperous mill owner and merchant of Sidney, also served as a member of the Assembly. He was arrested in Dec 1837 for suspected rebel sympathy and his subsequent claim for rebelion loses state that William Bane, the man who had been sent, had helped himself to some of his possessions while performing his duty. He spent about 2 weeks in goal and then had to return to Kingston for a trial that never took place. Reuben White, yeoman, was arrested after the 1837 Rebellion on 17 Dec 1837 and discharged on 2 Jan 1838. He was not tried and instead was admitted to bail by the Attoney General. SOURCE: "Return to an address of the honourable, the House of Commons, dated 8 May 1838, for return of the names and quality and station of the several (over 800 names listed) persons arrested in Upper Canada and placed in confinement in the prisons in Toronto and other places in the province , on the charge of insurrection or treason .....", Great Britain, Colonial Office, Downing Street, 1839, TRL, 971.054.G67.3. Source: W.L. Mackenzie Correspondence, June 1830- Feb 1838, AO, MS516, reel 2, pp 1187/8, dated 22 Dec 1837. Letter to WLM from C.H. McCollom, copy WRS files. In the name of God Amen I Reuben White of the Township of Sidney, County of Hastings and Province of Canada, considering the uncertainty of this mortal life, being of sound mind and memory praise be to Almighty God for the same do make and publish this my last will and testament in the manner and form following that is to say: In the first place I give my soul to Almighty God who gave it and my body to be interred where and available to those who may have to duty to perform the same. Secondly I give and bequeath unto my beloved wife Esther White all my household furniture to dispose of as she may think proper and also the sum of Twenty five Pounds Cy per year during her natural life, the same to be paid to her by my youngest son Franklin White either in board, clothing or money as she may require or desire. I give and bequeath unto my son Stephen White the front half of lot No. 23 in the fourth concession of the Township of Sidney with all the notes and accounts which I hold against him, I further give unto my son Webster .. line missing ... paid for him towards the purchase of the farm where he now lives. I further give unto my son Franklin White the west half of Lot W13 in the first concession of the township of Sidney with its broken front and all the buildings erected thereon for a period if ten years, after which time his son Benjamin Franklin White shall have and hold the said estate. And in case of decease of his son Benjamin Franklin White before the expiration of the said ten years the estate shall descend to son Franklin White and his heirs and assigns forever. After the death of his mother Esther White and by paying her the amount which I have decreed , and in case of his decease and leaving a widow she shall be entitled to no Dower on the estate. And I further will unto my daughters Elizabeth Yager, Caroline Lawrence and Phoebe Saylor each the sum of one hundred pounds out of my estate. And I further will unto my daughter Phoebe Saylor, the front half of Lot W 4 in the 4th concession of the township of Sidney and the east half of the Rear of said lot containing one hundred and fifty acres to her, her heirs and assigns forever. Also ten acres and a half in the first concession of Sidney and which may be better known or described as being composed of the broken front or part thereof on the east half of Lot W 4 together with all the buildings and improvements thereon. I hereby will unto my daughter Hannah Jones the sum of fifty pounds out of my estate and I further will unto my daughter Clarissa Smith the sum of fifty pounds over and above the sum of one hundred and twenty five pounds which I loaned to her husband Robert Smith. And I further will that all the Notes Bank Accounts and Mortgages shall be collected by my executors except the note that I have against Robert Smith shall be equally divided between all my children except Clarissa Smith and I further will that all my lands which have been sold and Bonds given for Deeds shall be fullfilled by my executors, which I shall be .. line missing ... willed hereby to my children shall be to them their heirs and assigns forever. And if any of my children or heirs shall disagree and find fault with this my last will their share and share shall be forfeited and equally divided amongst all my other children. And further should there be any more property belonging to me found that has not already been disposed of by the above will it shall be equally divided amongst all of my children share and share alike. - And in case any more is willed than there is property to be found there shall be a reduction made share and share alike amongst all of my children. And I further more appoint my widow Esther White my son Webster White and Cornelius Lawrence to be my sole executor to this my last will and testament , which executors shall have power to appoint an attorney or attornies learned in the law if the aid and assistance should be required in settling the above will. Hereby revoking all former wills by me made. In witness whereof I do hereby set my hand this seventeenth day of June in the year of our Lord one thousand eight hundred and fifty six. Schedule of Goods and Chattels of the late Reuben White, Esq, taken Jan 18, 1858. Executors: C. Lawrence, Webster White. Headstone reads: Reuben White, died Jan 6, 1858, aged 79 y. Died at his residence in Sidney, on Wed, January 6, Reuben White, Esq, aged 79 years. Note: The AO does not have other local newspapers for Trenton and Belleville for this date. 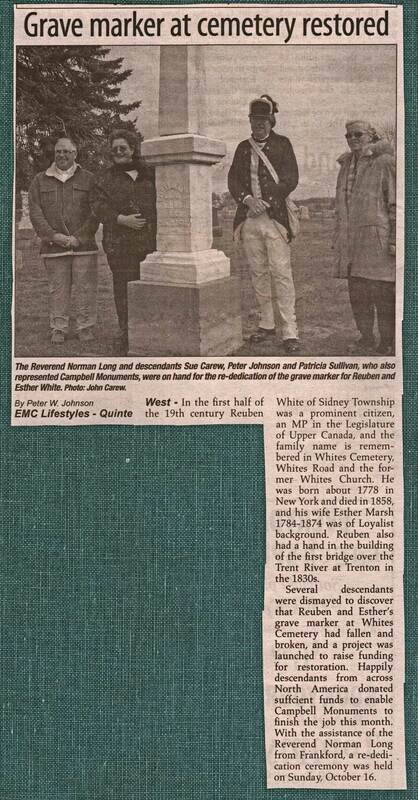 On 11 Oct 2011, group led by Peter Johnson, UE, rededicated the gravemarker of Reuben White and his wife Esther Marsh in Whites Cemetery. Money was raised from volunteers to repair the broken monument and to restore it to its long held spot. See this newspaper article about the event. Mary Ellen White, born 9th Aug Ult, daughter of Thomas White of Hillier & of Sarah his wife was publicly baptized in St John's Church, on the 27th Sept 1837 by me, John Grier, Minister to Murray.